Intel’s Executive VP, Sean Maloney, had a few things to say about the chip giant’s future product lines at Computex 2011’s opening keynote speech yesterday, where he confirmed a few rumours about the company’s plans for Atom, Ivy Bridge, and Medfield processors. In the meanwhile, zol.com.cn managed to get their hands on Intel’s desktop processor roadmap until the end of 2012, putting things in perspective. 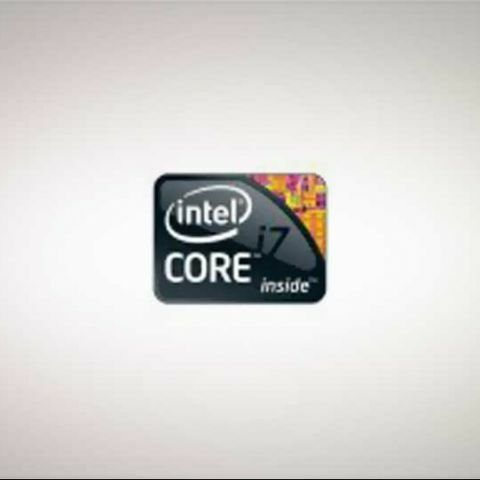 With the keynote, Maloney defined a new category of mainstream thin and light mobile computers, called Ultrabook by Intel, which will be powered by the upcoming Ivy Bridge processors (3rd Generation Intel Core processors built on the 22nm process). The company believes that by the end of 2012, at least 40% of the consumer laptop market will be made up of ultra-thin (less than 20mm thick), ultra-light, high-performance low-power consumption Ultrabooks. The first of these devices, featuring Sandy Bridge processors, will be available by the end of 2011, with Asus the only announced partner so far, with its UX21 notebook. The company intends “accelerating the Atom processor roadmap to a one-process-generation per year cadence to enable a wider range of optimized solutions for multiple market segments.” In other words, Intel will be releasing new Atom chips based on a new process every year, starting with Cedar Trail, or 32nm this year, and moving on to 22nm, and 14nm in successive years. As Intel progresses, it aims to significantly reduce transistor leakage and active power requirements, while increasing transistor density. New features such as such as Intel Rapid Start technology (for fast resume and boot) and Intel Smart Connect Technology (for standby synching) will only help with these aims. The first 32nm Cedar Trail processors, available in the second half of this year, are expected to enable ultra-thin fanless devices, offer improved graphics performance, and allow over 10 hours of battery life and standby times that can be measured in weeks. It will support a variety of operating systems, from Windows to ChromeOS to MeeGo. Maloney also said that Intel’s latest Atom Oak Trail processor (the 45nm 1-core 2-threads Atom Z670) has enjoyed critical success already, with over 35 wins for the platform since its release earlier this year, and widespread adoption by numerous major companies. 10 tablets are already available based on this architecture. 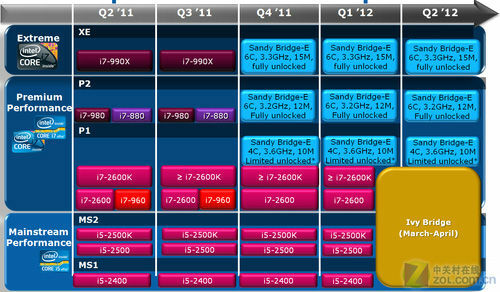 Ivy Bridge has been officially scheduled for a H1 2012 release, though with the leaked roadmap, the first machines look like they will probably arrive by the first quarter. Ivy Bridge will be Intel’s first high-volume chip that’s based on the 22nm process, and uses the new 3D transistor design called Tri-Gate. Apart from a boost in clock speed with the more efficient 22nm process, Ivy Bridge will also have support for PCI Express 3.0, USB 3.0, Intel Thunderbolt, and a new type of chipset that will feature both DirectX 11 (OpenGL 4) and OpenCL 1.1. Medfield processors are expected to enable tablet designs that are less than 9mm thick, weigh less than 1.5 pounds, and offer large battery lives. Maloney showed off a Medfield tablet at the event, which was running Android Honeycomb. Medfield devices are expected to hit the market by the first half of 2012. Advice on Intel or AMD CPU and motherboard config. how to create a network Bridge?